(The Eye) had an unrelated Spider-Woman, Marvel itself had The Black Widow, and even DC had Tarantula. The first of them came from Quality Comics (which, by the way, later fielded The Spider Widow), and was called simply The Spider. Wealthy idler Tom Hallaway, "alias The Spider" (as the series was titled) was introduced in Quality's Crack Comics #1 (May, 1940), where Madam Fatal and The Black Condor also made their debuts. (The Clock was there too, but he'd transferred from another title.) He had a little more motive than the average idler-turned-superhero, such as Firebrand, Miss Fury or Lady Luck, who were merely adding spice to their otherwise useless lives. Tom actually wanted to see less crime in the world. It was to bring about that happy state that he put on a bright costume and bent his skills to the elimination of criminals. His only confidant was Chuck, who served him as valet in the normal world and sidekick in his superhero identity. Tom's skills included expert archery, so he used used a bow, anticipating Green Arrow but lagging far behind Centaur's The Arrow. His ability to use the weapon was within the normal human range, but he wasn't averse to using trick arrows. He also wasn't averse to occasionally killing the human scum he dealt with. He didn't have any superhuman abilities, or any special ones that were particularly spider-like. In fact, nothing about his appearance or actions suggested spiders, except naming his car (fastest in town, of course) The Black Widow. Apparently he just thought calling himself The Spider sounded cool. Whatever the reason, the character was created by cartoonist Paul Gustavson, whose other creations for Quality include The Human Bomb and The Jester. Gustavson continued writing and drawing "Alias The Spider" for about two and a half years, which was most of the time the feature lasted. Crack #30 (August, 1943) contained the final Spider story. A couple of issues later, Beezy Bumble, a funny feature by Bernard Dibble (Iron Vic, The Captain & the Kids), appeared in the slot it had occupied, and Quality Comics was through with The Spider. 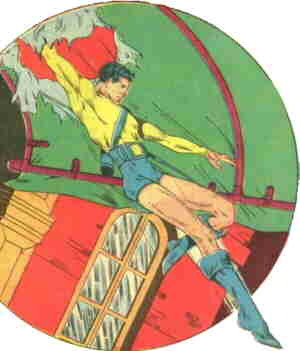 Quality folded in 1956, and DC Comics acquired many of its characters. The Spider was ignored for a long time, but eventually made a few minor appearances in All-Star Squadron and Young All-Stars during the 1980s. Later, they retconned him to make his original crime-fighting motivation less benign — he wanted to eliminate criminals because they competed with his own criminal activities. In the process, they connected him to a crime family that has bedeviled Starman. DC. also revised the past to tie him in with The Seven Soldiers of Victory. In the current DC Universe, his son has assumed the role of The Spider, and now carries on his unsavory work.